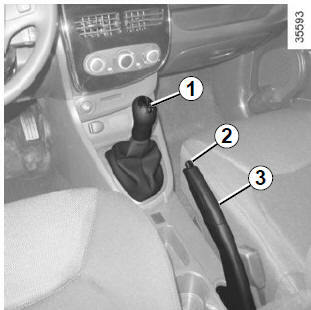 Vehicles with manual gearbox: refer to the grid on the gear lever knob 1. Vehicles with automatic gearbox: refer to the information on the “Automatic gearbox” in Section 2. Selecting reverse gear The reversing lights will come on as soon as reverse gear is selected with the ignition on. To release: Pull the lever 3 up slightly, press button 2 and then lower the lever to the floor. The red warning light on the instrument panel will come on if you are driving with an incorrectly released handbrake. Make sure that the handbrake is fully released when driving (red indicator light off), otherwise overheating, or even damage, may occur. When stationary, and depending on the slope and/or vehicle load, it may be necessary to pull up the handbrake at least two extra notches and engage a gear (1st or reverse gear) for vehicles with a manual gearbox or position P for vehicles with an automatic gearbox.